Spring is finally here in Melbourne. The days are warmer, nights milder (barring the crazy days we still get and are renowned for) and everything is in full bloom. Unfortunately for many, this is also a season of allergies with lots of pollen and airborne irritants floating around, causing itches, sneezes and other skin irritations. Fortunately, I don't really suffer from the seasonal allergies but I do have a mild case of eczema that leaves my skin in a perpetual scaly and dry state. A recent trip to the dermatologist prompted me to review the skin products I've been using that may exacerbate the problem. So I started looking at the soaps I use and noticed that the key ingredients in them is sodium laureth sulfate, a known skin irritant and is quite harsh for sensitive skin. I didn't think I had sensitive skin as they don't get itchy and I don't break out in rashes but hey, what do I know? So off I went to look out for a more gentle soap. Made locally with goat's mild, sweet almond oil, glycerin and vitamin E to soothe and moisturise irritated skin. Fresh scent of freesia - but not too overwhelming during use which is good as fragrances can irritate sensitive skins. provides a very good lather so I get that nice clean feeling and it leaves skin soft as a baby's bum. The scaling on my skin has improved quite a bit. It's not all gone but I hope that with continued use, I'll see further improvements. Is a soft soap so can dissolve faster than regual hard bar soaps if you don't leave it in a dry soap dish. environmentally friendly with no phosphates used to make the product. In fact, I thought it worked so well for irritated skin I also bought a bar for my dad who suffers from some sort of permanent itch and is forever scratching his skin until they are raw and bleeding (no joke!). He was skeptical at first but decided to give it a try. After finishing up a whole bar, his legs look so much clearer without the scratching and he isn't itching anymore. He's even decided to stock up himself and ditch the Pintasol medicated soap that didn't really help his skin irritations. So if you have sensitive skin and find youself itching (and not in the good way), look into goat milk soap. This one is affordable and readily available so you have got nothing to lose, except that itch of course. Rating: 10/10. RRP A$3.39 available from Chemist Warehouse and leading pharmacies. Ling - I know I hate the smell of Pintarsol, and it's drying on skin too. My derm told me not to use it anymore. I think you have misread the ingredients, it states NO SLS and no to other ingredients, i think you need to read it thoroughly, sorry to point that out. 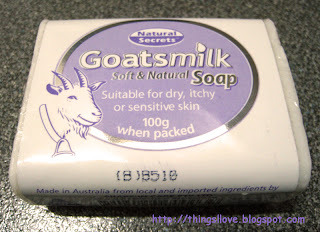 Hi there, I wrote that the soaps I used at the time had LSL, not this Goats milk one. Sorry if I confused you.